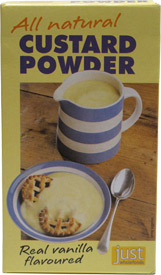 Thought that you would never see egg-free custard? Think again! This vegan mix makes delicious dairy-free vanilla custard in a matter of minutes. Simply add a tablespoon of your preferred sweetener and a little soy/rice milk for a tasty dessert that’s made without artificial ingredients. It's delicious over baked treats like muffins, vegan scones and cakes! 3.5 oz. (100g) package makes 5 pints of delicious vegan vanilla custard. $3.49 per box. From Debby Jelley of New Durham, New Hampshire on 9/13/2012 . I just tried my first batch and it is delicious, very similar to the custard I made years ago (pre-vegan). I added an extra teaspoon more custard powder than stated in the instructions, and it made it just thick enough. I was pleased to find that it will make many batches as I thought the box contained only enough for one. I am already thinking of ideas to change it up such as adding vegan caramel syrup, maple syrup or other natural flavorings, but I also like it plain.